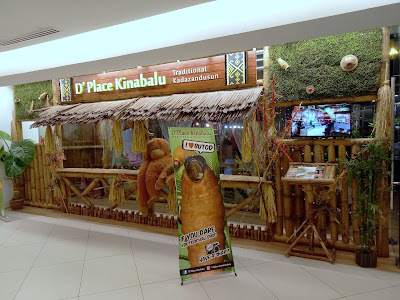 If you are keen to savor authentic Kadazandusun cuisine, one of the best places in Kota Kinabalu is D' Place Kinabalu in Plaza Shell. 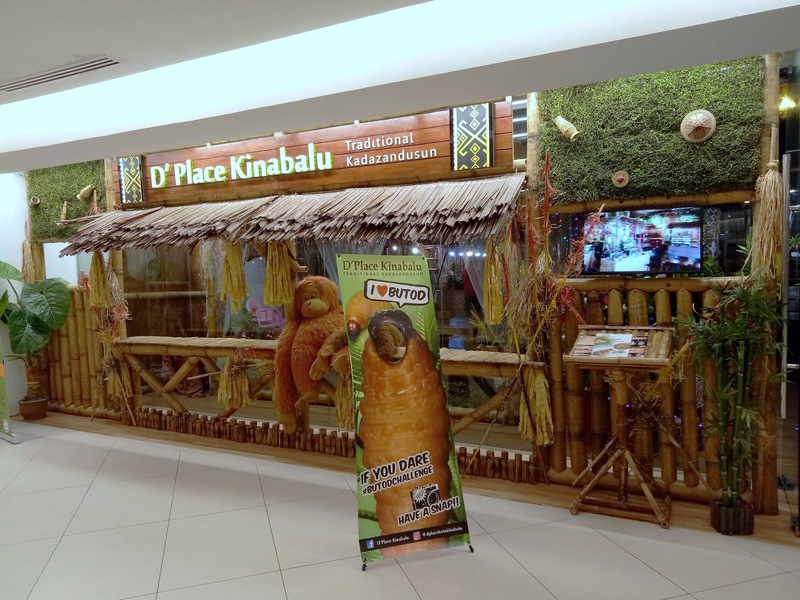 The restaurant's facade features a longhouse with thatched roof and an orang utan. 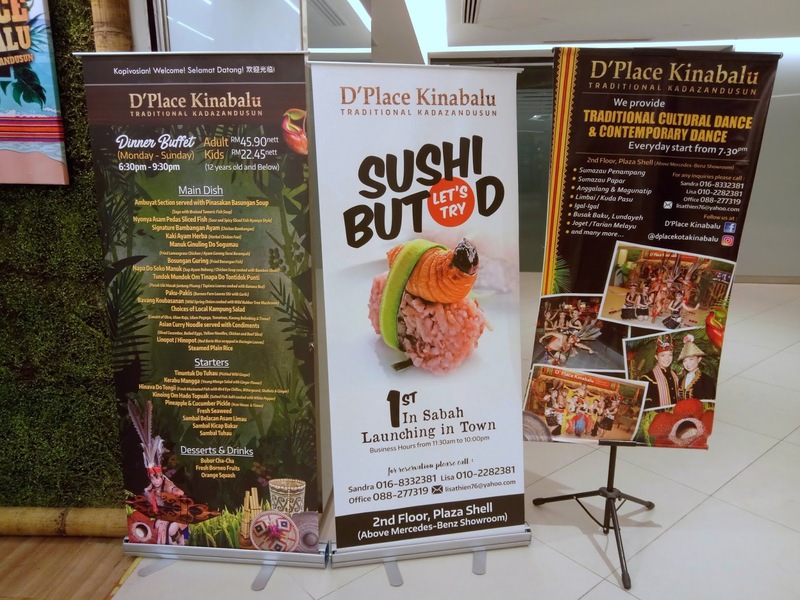 D' Place Kinabalu serves buffet dinner every evening from 6:30pm to 9:30pm. Rice is the staple food of Kadazandusun people. Linopot is a traditional dish where rice and mashed taro are wrapped in doringin leaves. While cooking, the rice is dyed purple by taro. 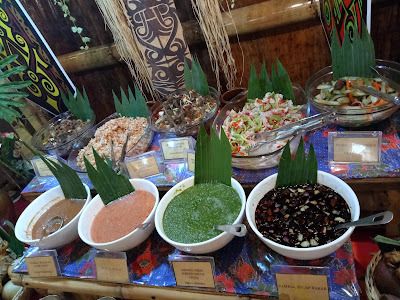 Linopot is customarily eaten with condiments such as Tuhau and Hinava. Another staple food in Borneo is Ambuyat, which is made of sago starch. Ambuyat is tasteless on its own, so it is typically dipped into Sup Pinasakan Bosungan. The traditional way to eat this dish is by using a two-pronged bamboo fork called candas. Pinasakan Bosungan is ikan basung (bigeye scads) braised in turmeric broth. 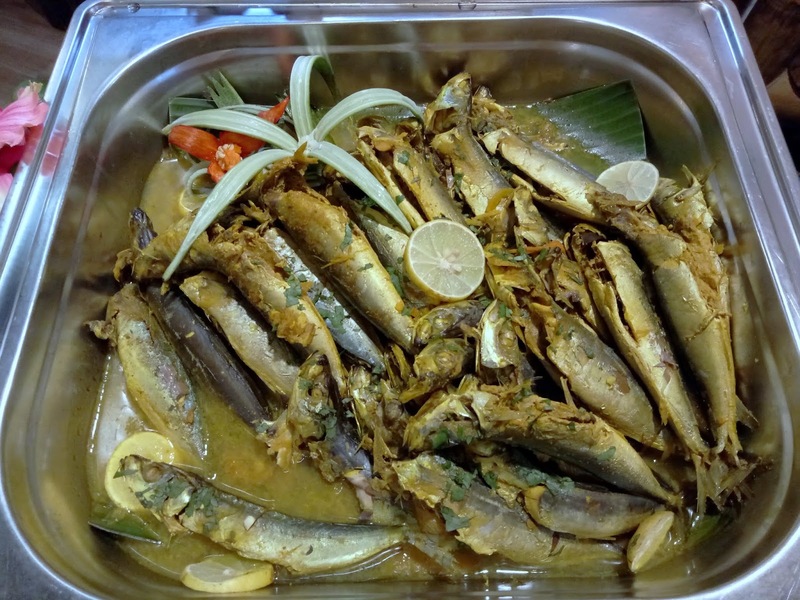 Similar in appearance to mackerel, ikan basung has lots of tiny bones. 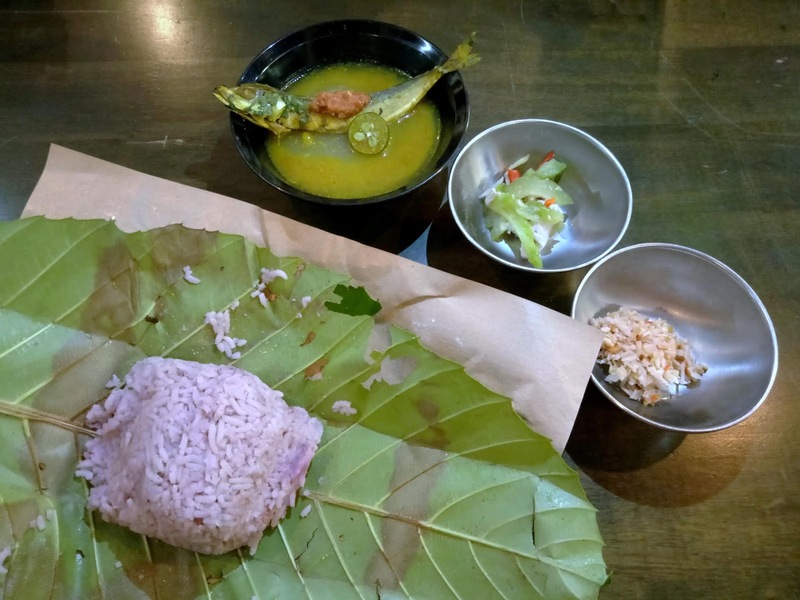 The fish is commonly used in Kadazandusun cuisine because it is fairly cheaply and easily available. The next dish is Rebung With Salted Fish. Bamboo shoots do not lose their crunchiness even when cooked. They are also capable of absorbing flavors from other ingredients, such as salted fish in this case. As for vegetables, Bavang Koubasanan uses wild spring onions that are only found in the Bornean rainforest. 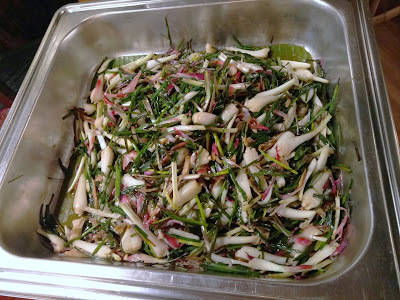 The dish is also fried with torch ginger, garlic chives and rubber tree mushrooms. 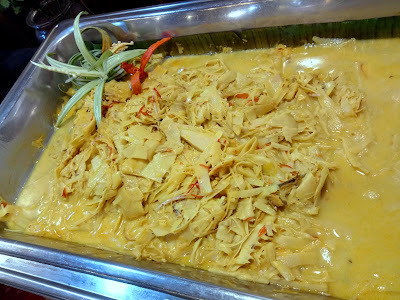 Moving on, Curry Chicken is well known among most Malaysians. 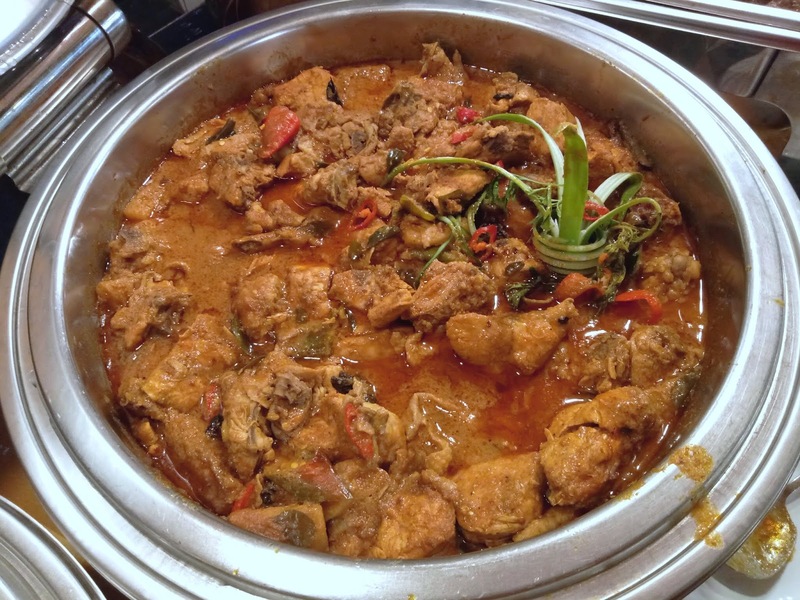 The spicy poultry dish is cooked with potatoes. Coconut milk gives the curry a creamy consistency. 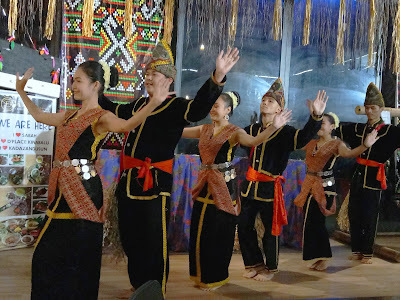 Kadazandusun people share many similarities with the Malays. 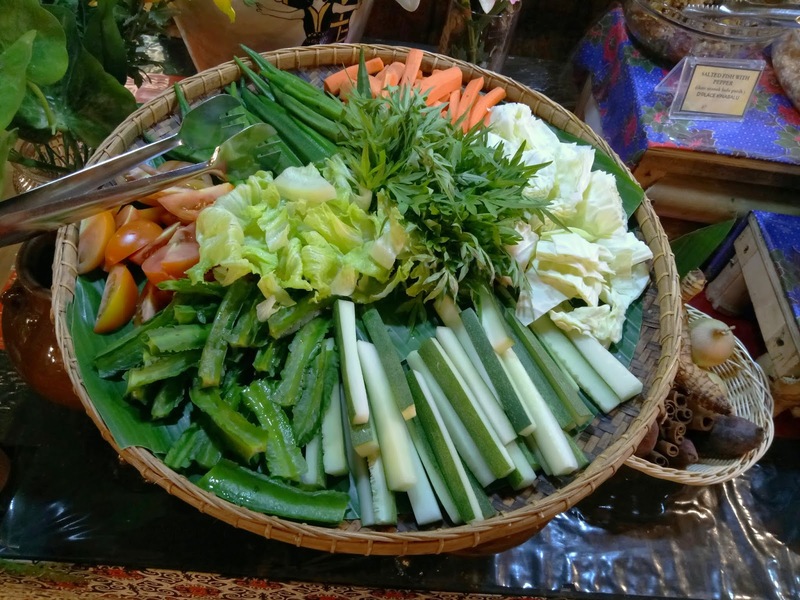 For instance, both cuisines often serve ulam-ulaman (raw vegetables) as appetizers. The vegetables presented here are ulam raja (king's salad), kacang botol (winged beans), okra (lady's finger), cucumber, carrots, tomatoes and cabbage. Dipping sauces for ulam-ulaman include sambal belacan asam limau (spicy sauce with shrimp paste & lime juice), sambal tuhau (pickled wild ginger sauce), sambal hijau (green chili sauce) and sambal kicap bakar (spicy soy sauce). 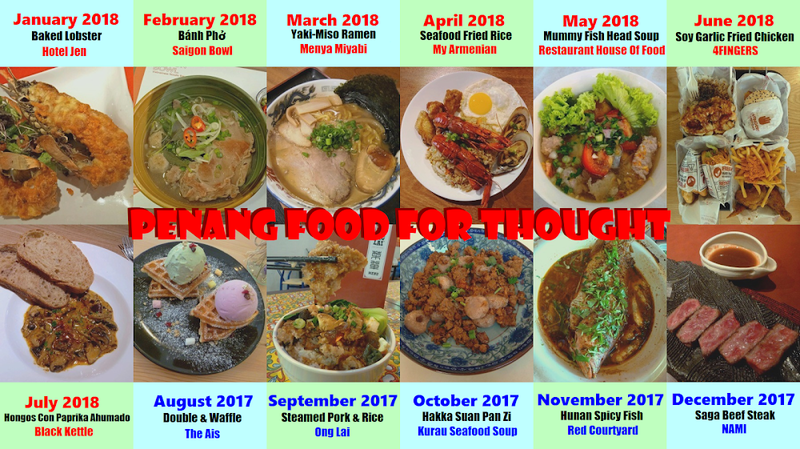 Also available is Asian Bambangan Curry Noodle. 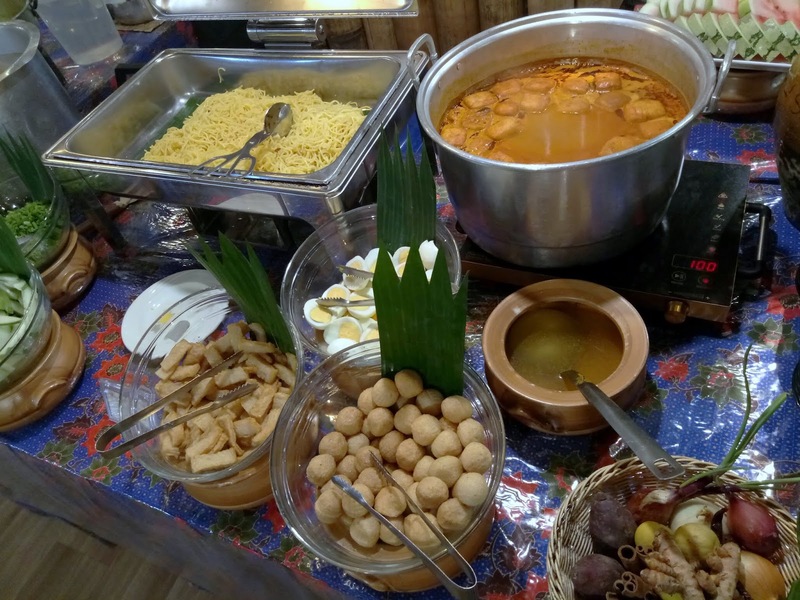 The noodle dish is served with curry, bambangan (wild mango) and tofu puffs. Other ingredients include fish balls, fishcakes and hard-boiled eggs. 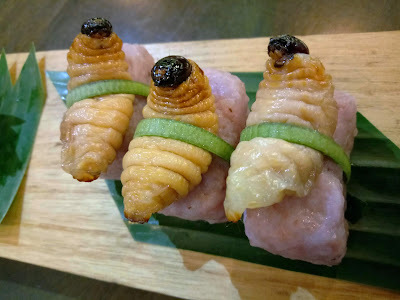 Butod, the larva of sago grub, is considered a delicacy in Borneo. D' Place Kinabalu has tank full of live ones! Butod is traditionally eaten raw or even alive. Alternatively, butod can also be fried or used for dishes like Sushi Butod (RM15.90). Its creamy body is a rich source of protein. The head is often discard because it has a hard shell. 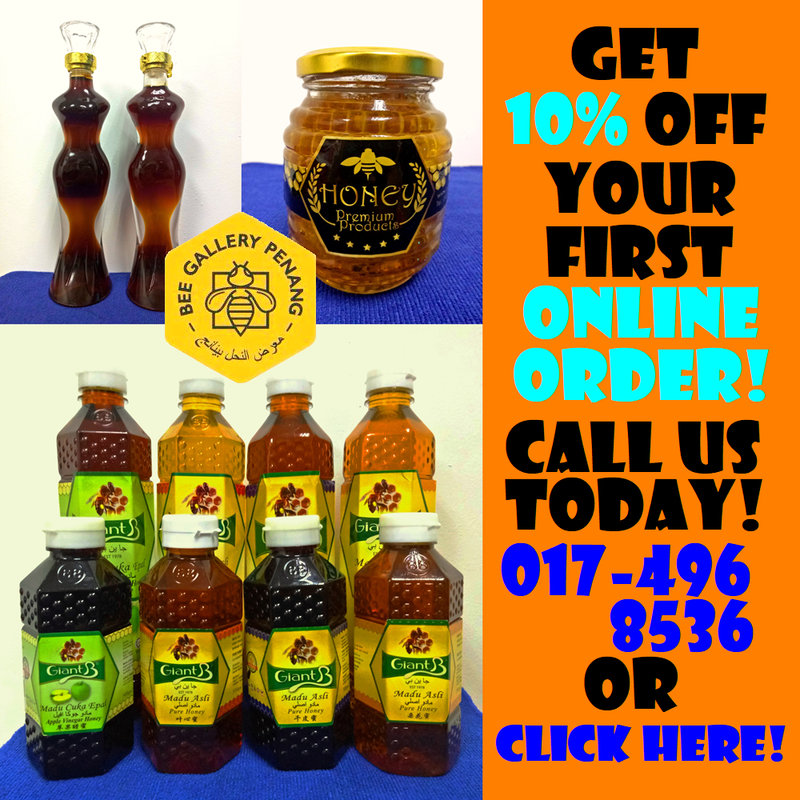 D' Place Kinabalu has several local products that can be purchased for home use. 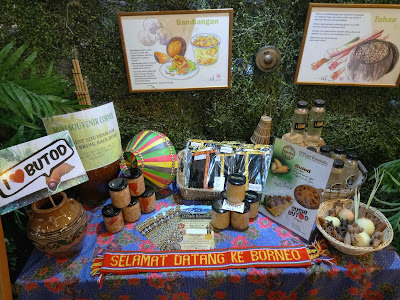 First, Bambangan is an endemic Bornean fruit that is sometimes dubbed "wild mango". Next, Tuhau is a traditional pickle made from wild ginger, lime juice, scallions, chili peppers and salt. Moving on, Hinava is marinated fish with wild ginger and lime juice. 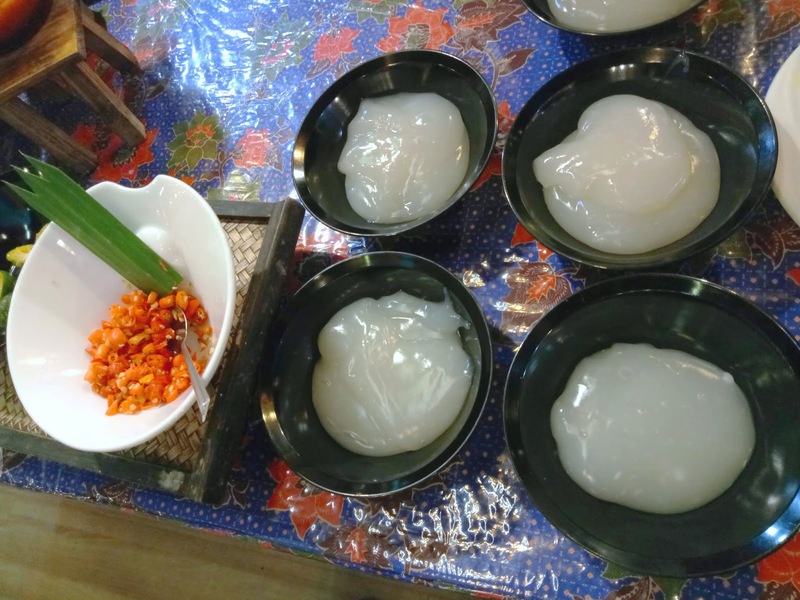 Lastly, Lihing is a popular wine fermented from glutinous rice. Starting 7:30pm every evening, a dance troupe entertains customers with a cultural performance in the dining area. The group showcases the traditional dances of several indigenous tribes in Sabah. The show also includes a demonstration of blowpipe marksmanship and magunatip dance. D' Place Kinabalu's buffet dinner is priced at RM45.90 net for adults and RM22.45 net for children. Drinks and butod are not included in the buffet and have to be ordered separately. During lunch hours, the restaurant has à la carte and set meal menus. The food here is entirely pork-free.